What's a lovelorn zombie to do? Mortimer tries all his best romantic moves on the ladies, gifting them with a maggoty box of chocolates, a shiny red (still beating?) heart, even a diamond ring (unfortunately, with decomposing finger still attached) all to no avail. Desperate, he finally puts out a personal ad, (to the tune of Escape, The Pina Colada Song) "If you like taking walks in the graveyard/and falling down in the rain. If you're not into cooking,/if you have half a brain./If you like waking up at midnight,/horror films, and voodoo,/then I'm the guy who you've looked for/and I'm dying to meet you!" Attending Cupid's Ball in hopes of scoring a date, he gives each of the attractive young ladies who approaches him a smile, "like this" (a close-up picture of Mortimer's gaping snaggle-toothed smile is featured.) Just as he's nearly about to give up, he finally meets the girl of his dreams - a zombie named Mildred. Soft watercolor illustrations in a slightly muted palette of colors give what could be a genuinely scary or gross story an undeniably cute charm. The illustrations are chock-full of little details, like Mortimer's coffee cup emblazoned with the slogan, "I (brain) Brains" or his computer mouse that is actually a mouse. Mortimer's zombie dog manages to make a dangling eyeball and exposed ribcage seem adorable. Best of all, are Mortimer's constant companions, and first-rate wingmen, a family of busy worms that follow him wherever he goes. I also enjoyed the "brain cake" the Mortimer dishes up on his picnic date with Mildred. I guess it's easy to draw the conclusion that if you're unlucky in love, the surest way to happiness is to lower your standards. Or maybe the moral is, there's someone for everyone. 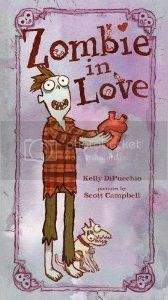 As a librarian, I love that this story will be equally appropriate for Halloween and Valentine's Day. Yay! Two holidays for the price of one! I'll recommend this to anyone who enjoyed the macabre and funny mash-up of holidays of Tim Burton's The Nightmare Before Christmas and to first and second-graders with a sense of humor.